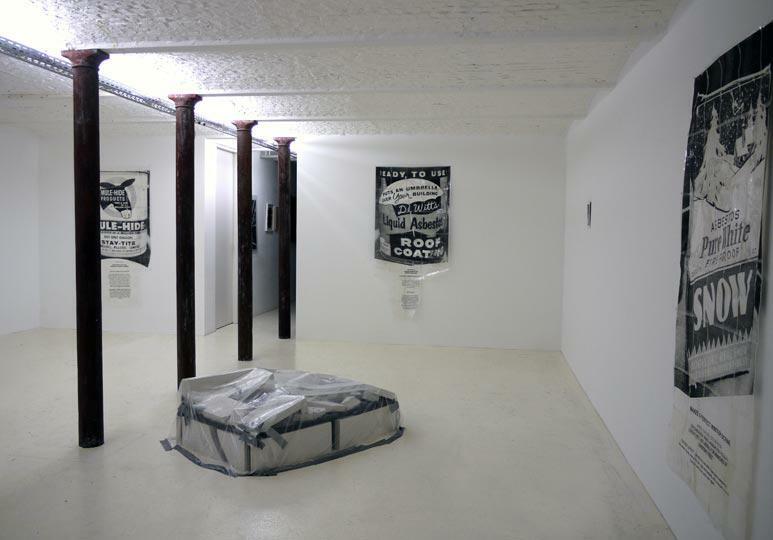 Elaine Lévy, a young gallerist in the rapidly expanding gallery hotspot that is Europe’s capital, currently hosts a solo exhibition by a young Belgian artist, Philippe Van Wolputte (°1982, Antwerp). The title, ‘Inside, Outside, Downside’, quite accurately expresses the show’s underlying tendencies. Having a background in street art and urban exploring, Van Wolputte spent several years in Amsterdam, where he attended the Rijksacademie. Meanwhile, he was avidly exploring the city’s architectural underbelly. 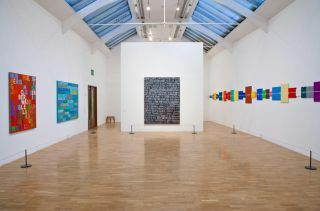 Gradually, his action radius shifted towards the gallery circuit - not that the ‘inside’ gallery system and the ‘outside’ reality of the street are to be seen as two separate realms. Van Wolputte’s work rather deals with what’s happening between the two. Informed by the notion of the ‘Temporary Autonomous Zone’ by anarchist writer Hakim Bey, his earlier practice experimented with the tactics of occupying and squatting. Needless to say this approach didn’t always match the mindset of the art world’s average members. 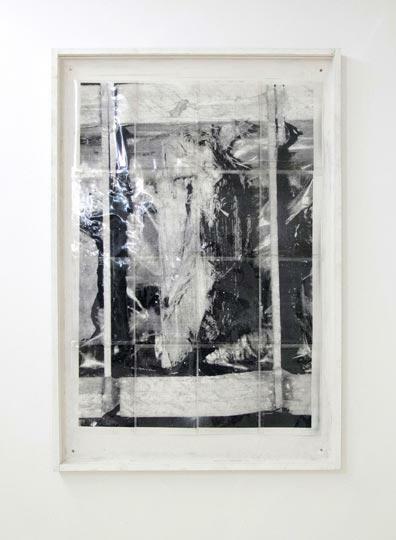 Somewhat frustrated by this incongruence, the artist decided to focus more on the documentation process, using grainy, black-and-white photographs or videos. Images that don’t merely reproduce, but succeed at conveying a certain atmosphere to the viewer, endorsed by their author’s straightforward visual approach. 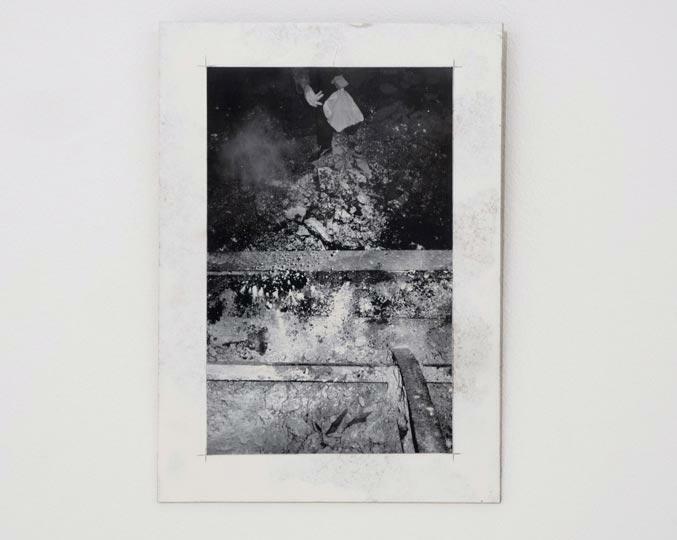 Deliberately evoking the use of documentation in 1960’s and 70’s performances and interventions (by, say, Gordon Matta-Clark with his Office Baroque), Van Wolputte takes pleasure in the creation and proliferation of myths around his own artistic process, often leaving the spectator in the dark as to the exact meaning or nature of his actions. 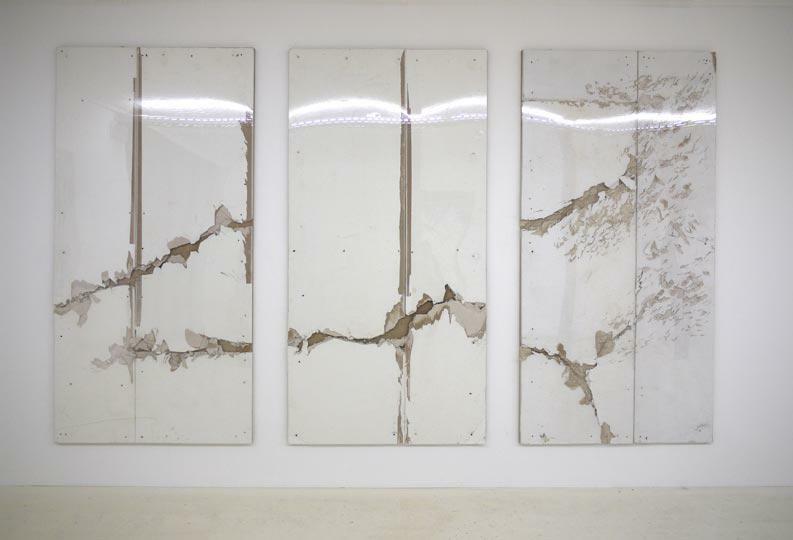 Subsequently, Van Wolputte started to reconstruct spatial settings within a gallery or museum context, often bearing visible marks of material decay, generating an almost violent rupture with the white cube’s cleanliness. There is one material, however, that keeps on showing up in his pieces: asbestos. 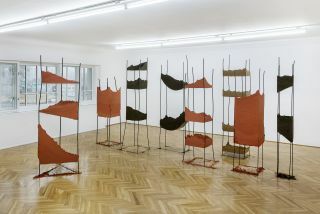 The solo show at Elaine Lévy is the culmination of Van Wolputte’s preoccupation with the mineral, which he frequently encountered on his urban wanderings. 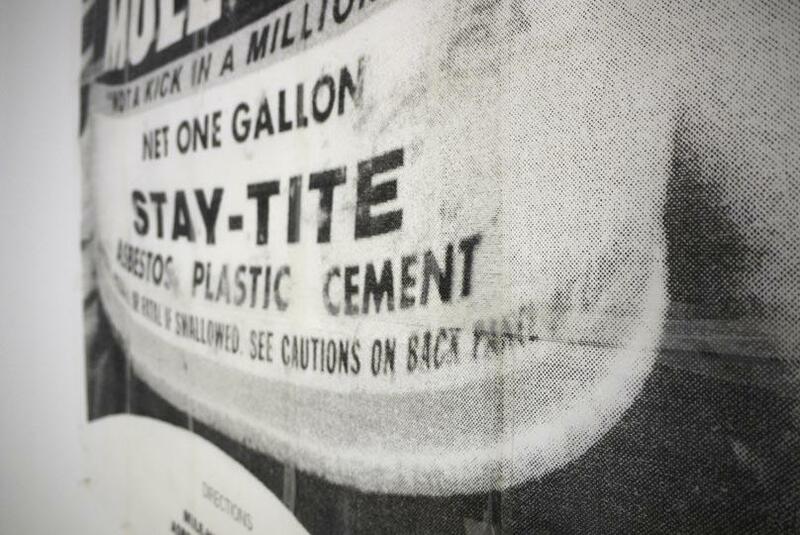 A source of fear for many people today, asbestos was still considered a pretty harmless and common substance back in the 70s, the proof of which we find in the enlarged, almost poppy advertisements the artist put on display. There’s one photograph of the hazardous mineral itself, with the physical threat being erased by the image surface. Another small photo seems to depict a public intervention by the artist, leaving us guessing at its supposed authenticity. On the floor is a small-scale construction sealed off with plastic and tape, an almost menacing presence haunting our visit. 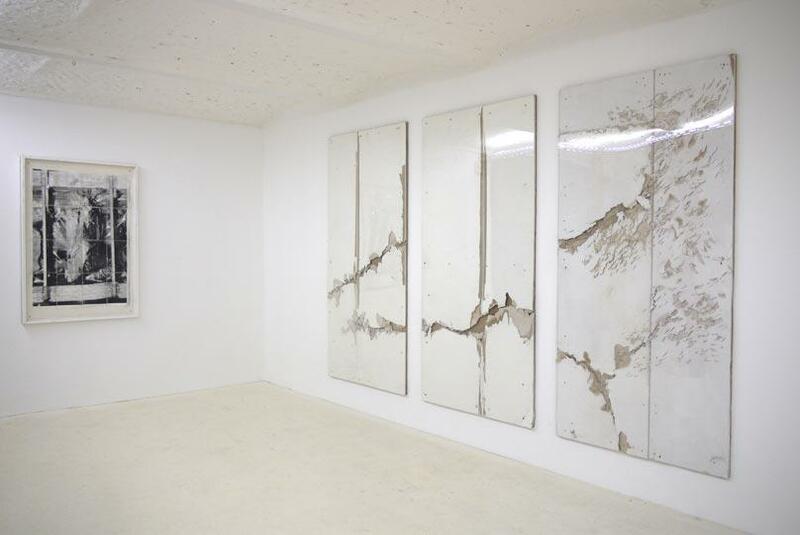 Standing out in its aestheticism is a triptych made out of white, cracked drywall panels covered with perspex. This may well seem like the artist’s most commercial show up to now, but his works still articulate a tangible tension with their exhibition format. It looks as if the artist himself is somehow hiding behind the scene, where he’s quietly trying to lure us into the dark.